in a combined edition for January/February 2011. I hope you had a great start in 2011 and life is treating you well wherever you are. Can you believe it? The first month of the year already has passed and time is flying faster than ever. Therefore this newsletter is a combined January/February edition and I guess most of you will be back at work now making plans for the year ahead. Life is buzzing in Cape Town again and personally we had some busy time organizing a move into new premises. Now with the kids back at school and the hot summer weather heating up the air, we realize again that moving always comes with some kind of complications and sometimes you really have to take some deep breaths not to "overheat". But moving is quite stressful no matter where you are in the world. So this edition is giving you some insights what to look out for when hiring builders or moving into a new home in Cape Town. So get a cool drink and enjoy this newsletter and please send me a line if you have some great suggestions. Enjoy! Here I want to answer some frequently asked questions and give you some handy tips for moving into a new home or office in Cape Town. Sometimes one street looks fine when you just pass by, however when you take your time for strolls in the area, you will get a better feel for the neighborhood and will pretty quick know if this is the right place to move in. Visit the area at different times of the day. Especially Sundays are good days to see if there are maybe more houses on sale in the area and you could even have a look at some properties and learn more about the people in the neighborhood. • Is living in a gated estate necessary to feel safe in Cape Town? Not necessarily, more importantly it depends on the surrounding area if you should consider living in a gated estate or golf estate. You really need to check out the suburb where the estate is located. Is there a township nearby or are there some illegal dwellings in the bushes or dunes nearby? If the gated estate is new, then there might be many construction sites on the estate and the numerous workers could pose a risk to your property or make you feel uneasy of living there. There are lots of rental and estate agents offering their services to newcomers and foreigners, but beware when you are required to put a deposit for a property in right away. Read the rental contract thoroughly and take your time. Don’t get pressured into signing without having all the information or when you feel uneasy. Only pay deposits into the agency’s trust account and not into the agent’s personal account and get a receipt. Reputable agencies will be able to give you also their SWIFT banking number for transferring money from overseas. • What to do when the property is not ready when the moving date has arrived? When major repairs or renovations still need to be done to the property you are renting or buying, then my advice would be that you do not move in, even if your container has arrived from overseas. You surely do not want to live with workers under your roof for weeks or months to come, do you? It will cost you less pain and money to have your contents stored instead of moving in and maybe out again after a couple of days or weeks when the premises are ready or you look for a better place to move in. If you move house, be aware that warranties usually are not transferable from owner to owner, so check out the property thoroughly and double-check any certificates or warranties you are provided with. Often they are not worth the money or value they claim to represent. So do not be fooled into accepting warranties from builders or companies. If you have alterations done to your property make sure you know what you expect from the workers. Always and really always get recommendations either from friends here or get references from the company, so ring the people up and make sure you will get the service you need. Check out any recommendations thoroughly. Get at least 3-5 quotes before deciding whom to hire and investigate thoroughly. Quotes should be given free of charge. Event of the Month: "Riverdance"
If you like Dance shows, then this show is a must for you to see this month. The famous Riverdance show is coming to Cape Town for only seven performances from February 23 - 27, 2011. So have a great evening out at the fabulous Cape Town Grand West Casino complex and enjoy the fascinating dance spectacle. 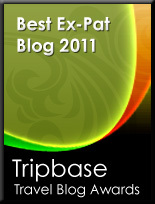 What is on in Cape Town in February 2011? In this section you will find every month insiders’ tips and advice about one of the many suburbs of Cape Town. So you know where to stay and where to go. This month I chose to bring you some more info about living in Table View, a suburb 20km north of Cape Town city center and adjacent to the Atlantic Ocean in Blouberg. Why Table View? 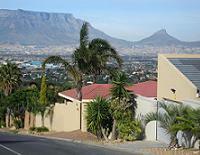 The suburb is located north of Cape Town and covers the huge area from Rietvlei up to Bloubergstrand. Often Table View is referred to the area east of the R27. The housing area to the left to the R27 is mainly referred to as Blouberg. There are good shopping and medical facilities in the area and some excellent private schools are located in nearby Parklands or Sunningdale. Where to stay? There is a wide range of housing available in the area, from flats and town houses to big free standing homes. Security is quite good in the area and you will find plenty of really nice housing areas, especially in Flamingo Vlei, which is the area south of Blaauwberg Road, where the Table View Primary and High Schools are located too. There is plenty of accommodation in guest houses and self-catering apartments available in Table View. Where to go? Beside the huge refurbished Bayside Shopping Center and Table View Shopping Center accross the road, there are some cozy coffee shops in the area as well and you will find lots of smaller shops along Blaauwberg Road. You will also find some international delicatessen in Table View like the Chinese Supermarket in Blaauwberg Road. What means "mielies"? This word is the Afrikaans word for "corn". The corn harvest takes place in South Africa in January and February in the Cape. When braaing mielies, you should try to heat the fresh cobs just for ten minutes in some hot water on the stove and then put them for a couple of minutes longer on the braai. Then enjoy really juicy corn. Delicious! What is a South African cafe? This term traditionally refers in South Africa to a small shop where you can get some essential food items, cigarettes and newspapers and not to a coffee shop. Lately more and more cafes Mediterranean style i.e. streetside coffee shops are popping up, so be aware of the difference to avoid confusion. Where to go for a delicious Italian buffet dinner? Head out to La Masseria in Eversdal/Durbanville, where on the weekends not only your taste buds are treated to wonderful Italian specialties but also you will be entertained with popular Italian songs and music. Enjoy the great atmosphere and sing along. Booking highly recommended. Where to really have fun in the museum? Join in one of the Pangolin Night Tours at the Museum of Gold in the Cape Town CBD. With torch and guide you will experience the fascination of gold in this stunning museum. Tours min. 4 persons, R50, booking essential. Where to see Stef Bos in concert? The popular Dutch entertainer will be at the Paul Cluver Amphitheatre in Grabouw on February 26, 2011. Reserve your tickets through Jacqueline at pr@cluver.com and receive a free glass of Paul Cluver Sauvignon Blanc 2010. As ExpatCapeTown wants to bring you the most up to date stories and insights, please be patient and let me surprise you with more great news about the Mother City in the new year.